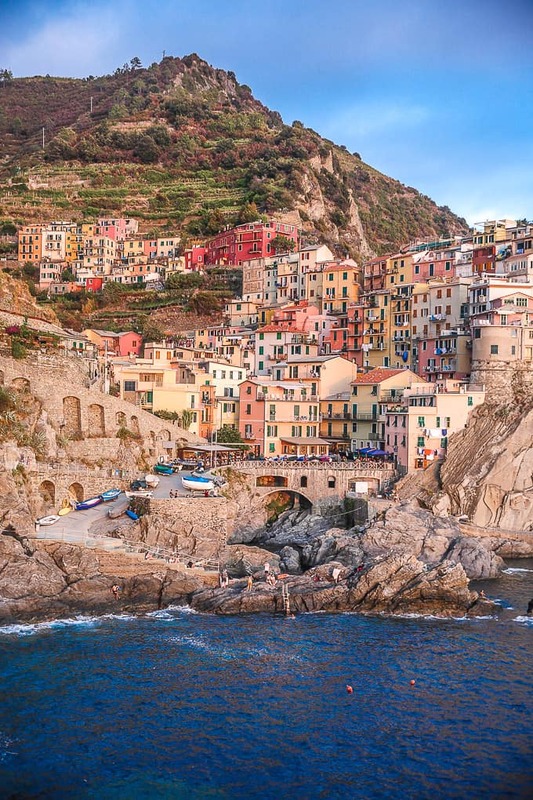 Hiking the Cinque Terre is one of the best ways to explore the famous 5 seaside villages: Monterosso Al Mare, Vernazza, Corniglia, Manarola, and Riomaggiore. Walking along the Cinque Terre hiking trail offers dramatic views that are not to be missed during your trip to Italy! 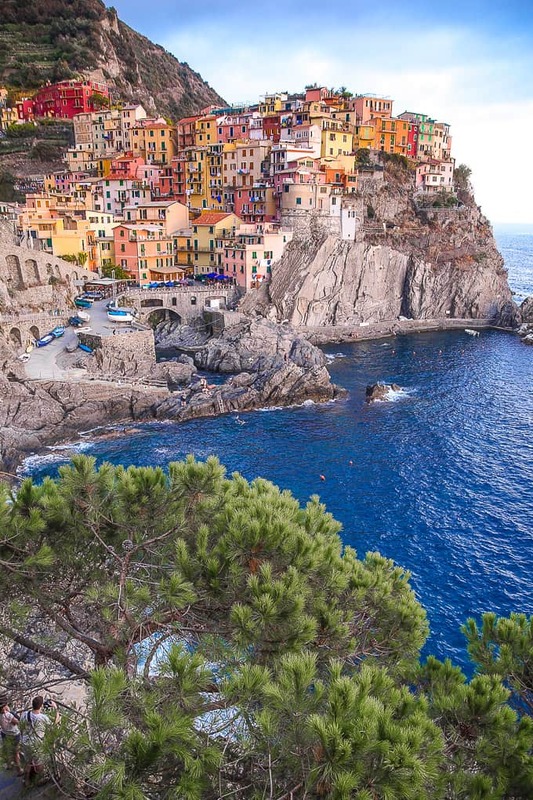 Cinque Terre is a group of five seaside villages in Liguria, which is located in the northwest of Italy. 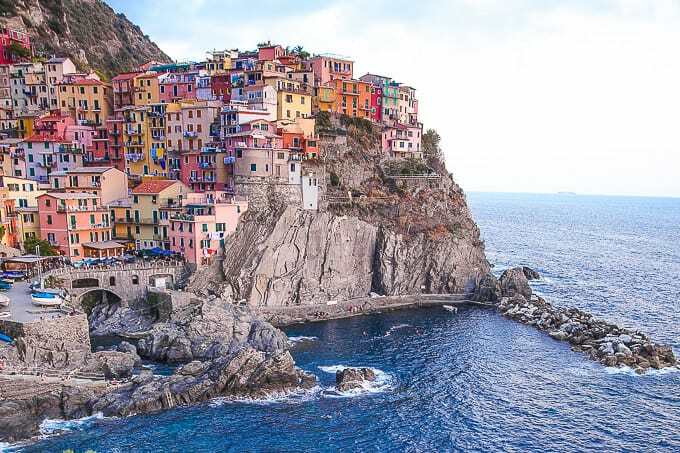 Cinque Terre means “five lands” in Italian and this name refers to the five coastal villages: Monterosso Al Mare, Vernazza, Corniglia, Manarola, and Riomaggiore. All five villages are built as terraces on steep cliffs overlooking the sea. The most popular trail is Trail #2 (Blue Trail). 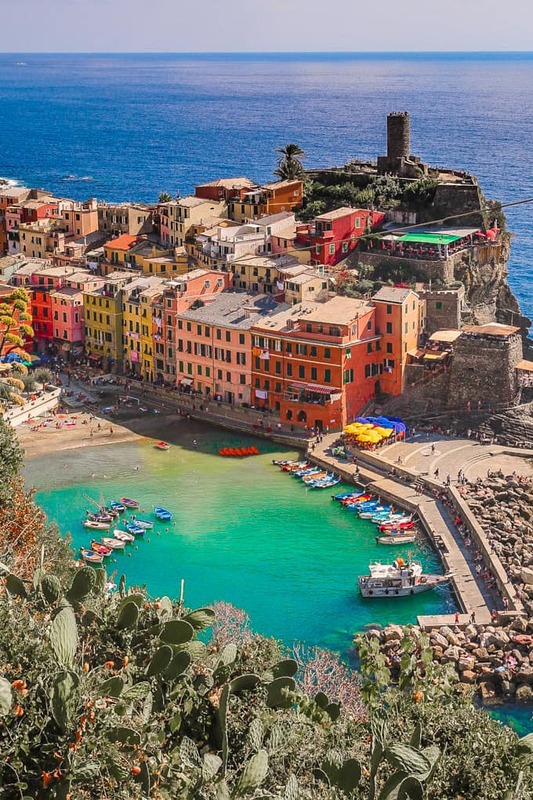 It’s made up of 4 individual paths connecting the five Cinque Terre villages: Monterosso Al Mare, Vernazza, Corniglia, Manarola, and Riomaggiore. The hiking trail passes close to the sea offering breathtaking views. Distance. The entire trail’s length is about 11 or 12 km. You can start from any direction. Start from Monterosso and end up in Riomaggiore. Or, start from Riomaggiore and end up in Monterosso. At any of the Cinque Terre villages, you can board the train and reach the next Cinque Terre village by train, instead of hiking. Hiking time. It takes about 6 hours to hike the entire trail at a relatively intense pace. So, unless you plan to spend most of the day hiking, it’s best to spread out the hiking over several days. This way, you can explore the coastal towns along the trail. Many tourists hike just a portion of the whole trail, and then take a train to the next town. 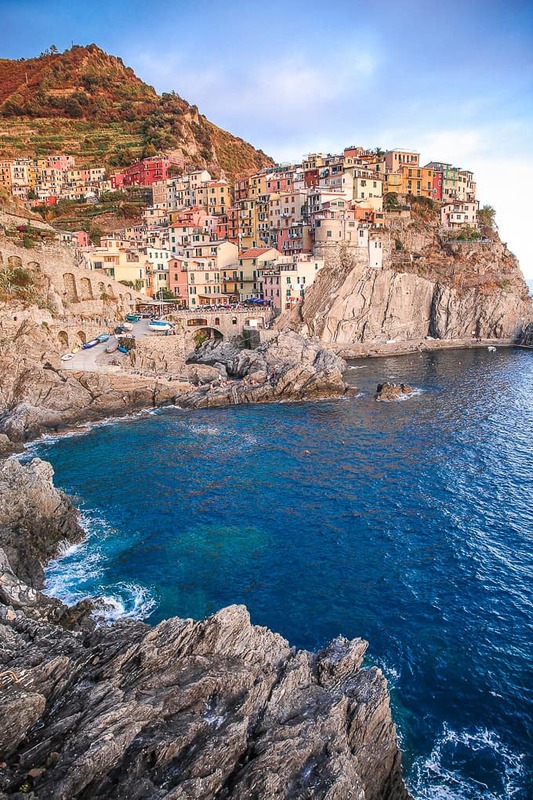 How do you get to Cinque Terre? The easiest way to reach the villages is by train. Start at either the town of Levanto or the town of La Spezia. Five Cinque Terre villages are located on the train route between the towns of Levanto and La Spezia. You can take a train to each of the five Cinque Terre villages either from Levanto or La Spezia (depending on which direction you choose). If you take a train from Levanto, your route will be Levanto, Monterosso, Vernazza, Corniglia, Manarola, Riomaggiore and La Spezia. 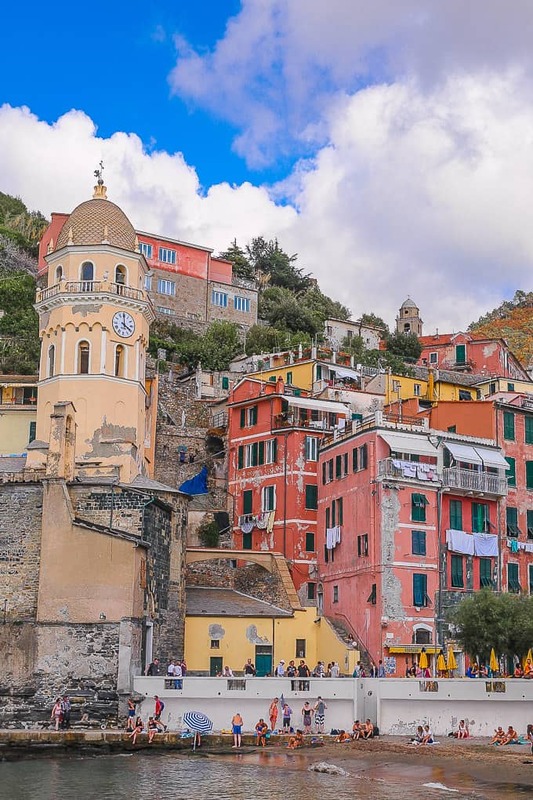 You can get off at any of these stations and visit any Cinque Terre village. Once you arrive at any of the five Cinque Terre villages, you can also hike to the next village (if the trail is open). If you take a train from La Spezia, your route will be La Spezia, Riomaggiore, Manarola, Corniglia, Vernazza, Monterosso, Levanto. Again, you can hike between any of the five Cinque Terre villages if the trail is open. Train ride duration. The train ride between each Cinque Terre village is only about 5 or 10 minutes. Difficulty level. The trail portion between Monterroso Al Mare and Vernazza is the most difficult and challenging of all Cinque Terre trails. There are lots of narrow steps and stairs to hike up and down. You have to climb lots of hills up and down. Remember that you can hike in either direction. Distance. The trail between Monterosso Al Mare and Vernazza is 3.5 km. It takes at least 2 or 3 hours of brisk hiking to get from Monterroso Al Mare to Vernazza. Stairs and steps. First, you do a lot of hiking up the stairs and up the steep steps when you start from Monterosso. As you’re hiking, take short stops along the way to enjoy the panoramic views of the sea. The most spectacular views. 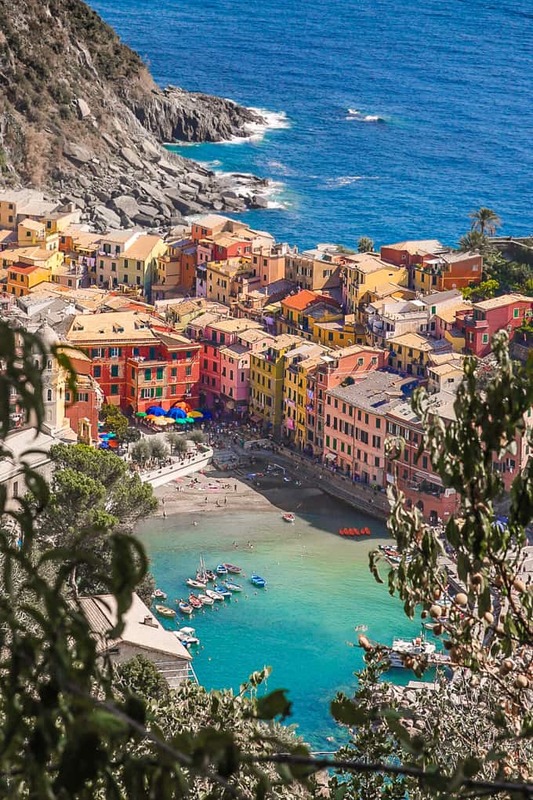 This portion of the Cinque Terre hike offers the best views along the whole trail. Breathtaking views of the sea. Once the trail starts to go down towards Vernazza, the views are nothing short of spectacular. 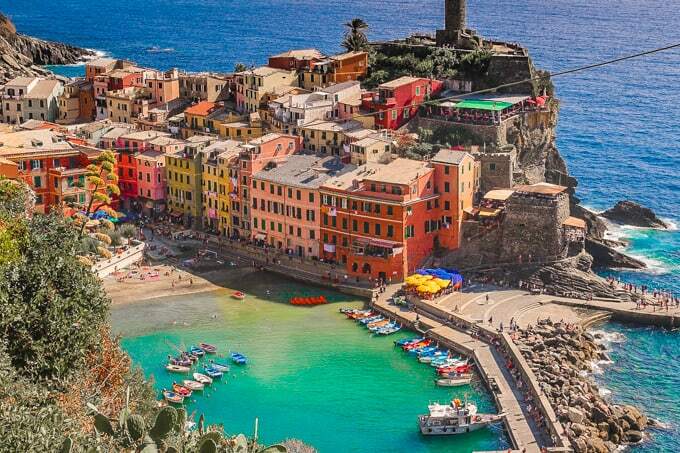 Vernazza is the most beautiful village of the Cinque Terre. The trail between Monterosso and Vernazza is my favorite hiking trail in Cinque Terre. Even though it is the hardest hike of all the trails in Cinque Terre, the views are breathtaking and so worth it. Because the hike is pretty intense and challenging, it is not hiked as much as other stretches of Cinque Terre trails. And, even though there are still plenty of people hiking it, it’s not as packed with hikers as other trails. Difficulty Level. The trail between Vernazza and Corniglia includes a fair amount of climbing up and down. There is a lot of ascending and descending. You can hike in either direction. Distance. The trail length is 4 km. Plan to spend at least 2 hours hiking this trail. Steps and stairs. There are a lot of steep stone steps to climb. Many times the steps are uneven, so you have to really pay attention. Make sure to wear appropriate shoes and have the right amount of water. Amazing views. However, the views are nothing short of spectacular. Hiking to and from Vernazza is my favorite portion of the Cinque Terre trail. Difficulty Level. The trail from Corniglia to Manarola is easy. Remember that you can hike in either direction. Distance. It’s about 2.5 km in length. It usually takes hikers 1 hour or a little longer to walk this trail. Difficulty Level. The trail between Manarola and Riomaggiore is easy and flat. The hiking path is paved and wide. Distance. Its length is 2 km, and it will take you about 1 hour of leisurely walking to finish the trail. 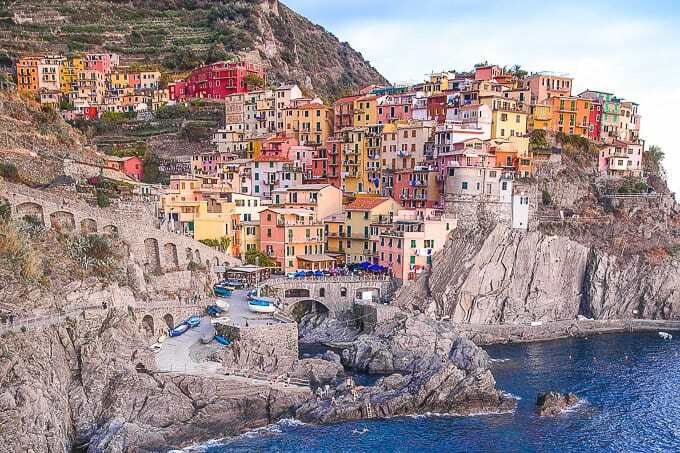 You can stay at any of the five Cinque Terre villages. However, keep in mind that they are crowded during the peak season. Stay in the town of La Spezia or the town of Levanto. If you want lesser crowds, it’s best to stay in towns close to the Cinque Terre area. Find accommodation in, near and around the towns of La Spezia or Levanto. 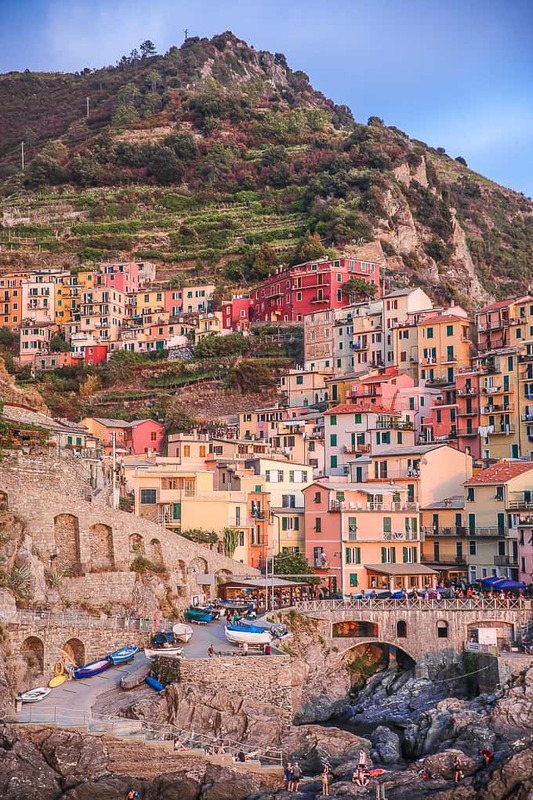 Then, from those towns, you can take a train to Cinque Terre. Moneglia. 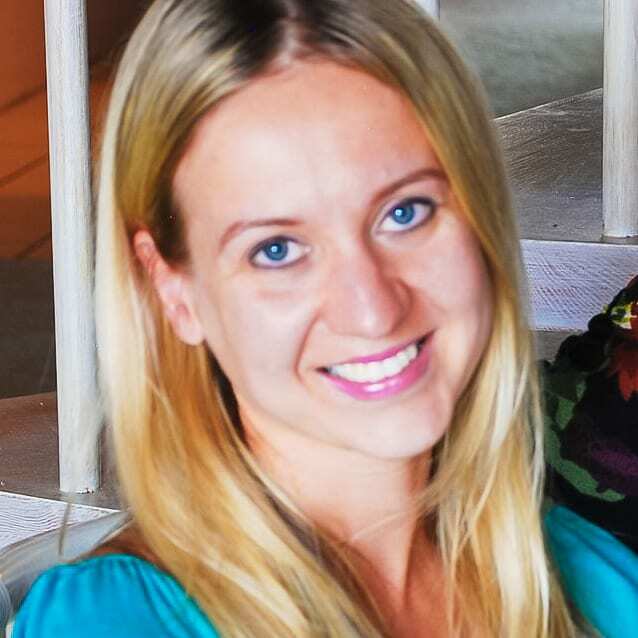 Another option is to stay at the beautiful, quiet, and laid-back beach town of Moneglia. One of the best hotels in Moneglia is Abbadia San Giorgio – a historic hotel set in a former monastery. 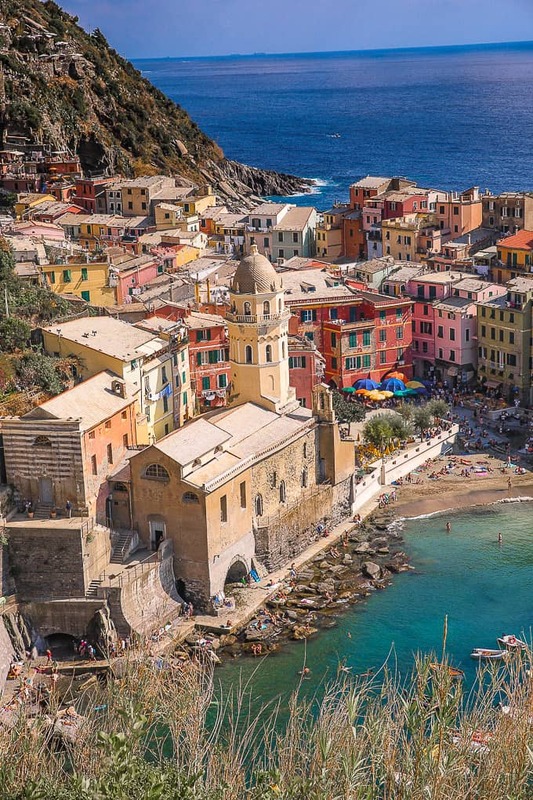 From Moneglia, it will take you only 30 minutes to get to Cinque Terre by train. To get access to Cinque Terre trail you will need to purchase Cinque Terre card. 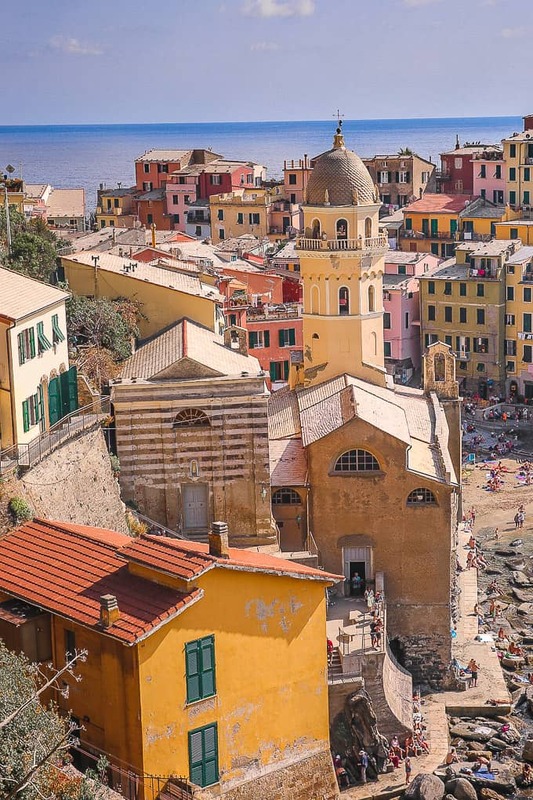 If you plan to use the train between any of the five Cinque Terre villages, make sure to purchase a card that includes train travel. This card includes train travel between all 5 villages on the route from Levanto and La Spezia. It also includes the admission fee to the hiking trail. Hiking shoes or boots. Wear sturdy hiking shoes. If you plan to hike more strenuous part of Cinque Terre trail, such as the portion between Monterosso and Vernazza, wear hiking boots. Bring water and snacks. Make sure to have enough water. Cinque Terre gets really hot in the Summer and even in September. Dress appropriately. Wear breathable clothing. Bring sunglasses and hats.